Rotary power converters within the Phase Change Converters range work differently to purely electronic drive or inverter systems. They don’t chop and re-combine rectified DC power to create a re-constituted 3-Phase, as the output is generated within the rotary pilot motor which behaves like a form of spinning power transformer. This means that the output is clean, stable and has a very low harmonic content. The large filters and chokes which should be compulsorily fitted to all-electronic drive systems are just not needed here. Sensitive electronic equipment such as CNC machines, instrumentation, PLC’s etc can be powered from the output of a Phase Changer. 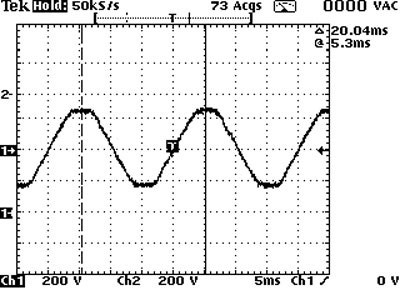 This is the actual waveform captured on one phase of the output on a Phase Changer. It is clean and undistorted. An inverter (VSD or VFD), is designed to run motors and not electronic circuits. It produces 3 phase, but not a clean sine wave, which is ok for a motor but usually not for controls and electronics. 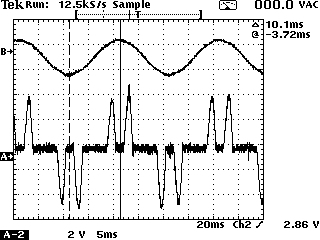 This is an example of the waveform output from a VSD/VFD. The blue sine-wave is shown for comparison purposes only. The drive does not generate this sine wave. Notice that the output from the VFD is a “rectangular” wave form. VFD’s do not produce a sinusoidal output. This rectangular waveform would not be a good choice for a general purpose distribution system, but is adequate for a motor. While VFD's provide great advantages in energy savings and increased efficiency, they are the #1 cause of electrical power system pollution. Reactors have become the most common means of reducing this pollution (or dirty power) and are in widespread use. VFD's tend to "gulp" current to recharge their capacitors each time the AC voltage reaches a peak. This results in short bursts of current as opposed to the normal sine wave that the utility expects to see. Think of it as flushing a toilet when someone is taking a shower, the water pressure in the shower drops suddenly. These short bursts of current have the same effect on the electrical power system, causing voltage drops in the power system and distortion of the voltage waveform. The magnitude of this distortion is referred to as either Total Harmonic Current Distortion (THID) or Total Harmonic Voltage Distortion (THVD). The larger the VFD, the more it will affect the power system. Think of this as noise that will pollute the power system, even traveling to neighboring facilities. High peak currents can also cause fuse degradation and intermittent blowing of fuses or tripping of circuit breakers. The following oscilloscope capture is taken from the supply feeding an 11KW 3 phase in / out VFD which is powered from a Phase Changer. The bottom trace shows how current is being taken from the incoming mains (in this case from the Phase Changer), which is the direct cause of Harmonic Distortion to the supply. The top trace is the mains voltage going into the Phase Changer, which is definately smoothing out some of the sinewave distortion the VFD creates on the mains. By comparison, a motor running DOL without a VFD would show a clean current sinewave almost in sequence with the supply voltage, and there would be no electrical noise or distortion on the incoming mains. 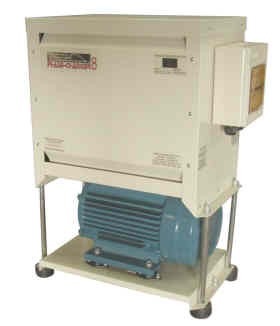 This is the same case when a motor is powered by 3 phase from a Phase Changer, the incoming mains remains clean without electrical noise and interference. Read our page Rotary vs Inverter for more practical information on the two technologies.